“The transition is easier for Duggar off the bat. He has some games in right in his recent past,” Bochy said before Wednesday’s game against the Los Angeles Dodgers, which the Giants lost 5-3. Bochy said he talked to both players after Tuesday’s game. Pillar was dealt earlier in the day and arrived during the game. Duggar made a nice play during the third inning on Wednesday, when he made a running catch on a David Freese fly ball that looked like it was going to drop for a single. He also had a home run in the fourth inning and went 5 for 13 with a double and a homer in the three-game series. 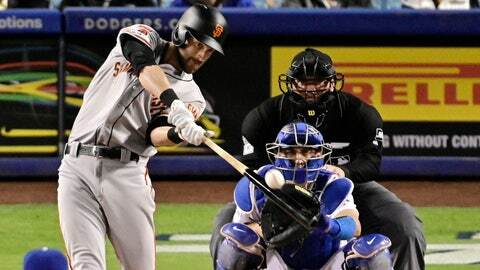 Bochy had Pillar batting sixth in Wednesday’s game— where he was hitless in four at-bats — but said that he will have him higher in the order when the matchup is against a left-hander.